I have always related to the metaphor that we all have a finite amount of bandwidth to deal with life at a given point in time. 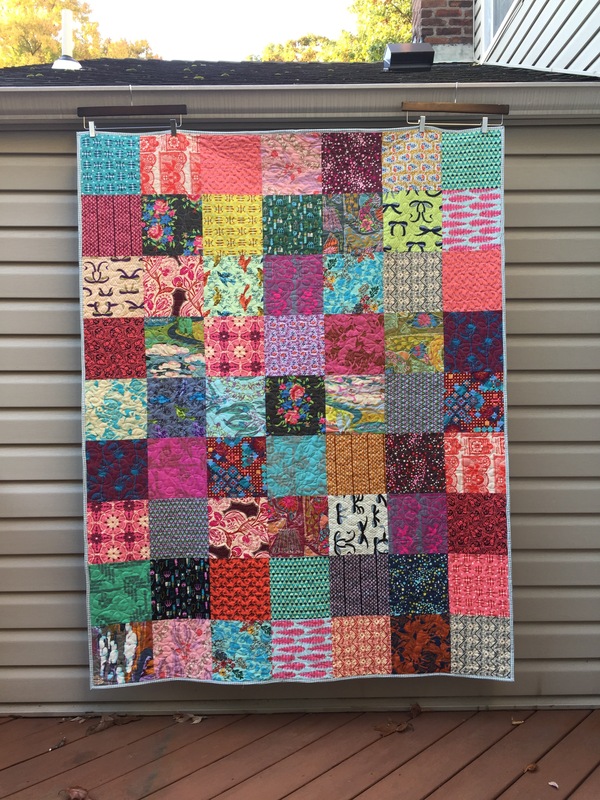 This month’s bandwidth has been maxed to its outer limits, though in the best possible way, with lots of quilting projects. Here’s a brief recap, for the record. 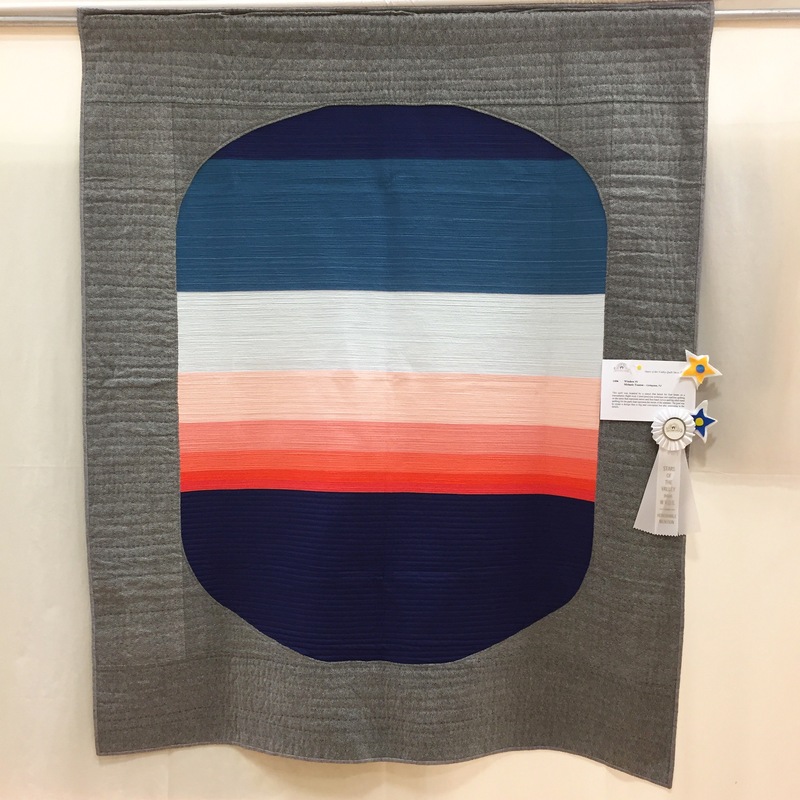 October means Houston quilt market, and I got to work on the coolest sample project for Elizabeth Olwen’s new line for Cloud9 Fabrics, Underwater. The full reveal will have to wait until next week, but I shared a few peeks at the improv curves on Instagram (where I’m @melintheattic). October is also breast cancer awareness month, and coincidentally we have a family friend whose diagnosis meant that we needed to send long distance hugs, something beautiful and quick. 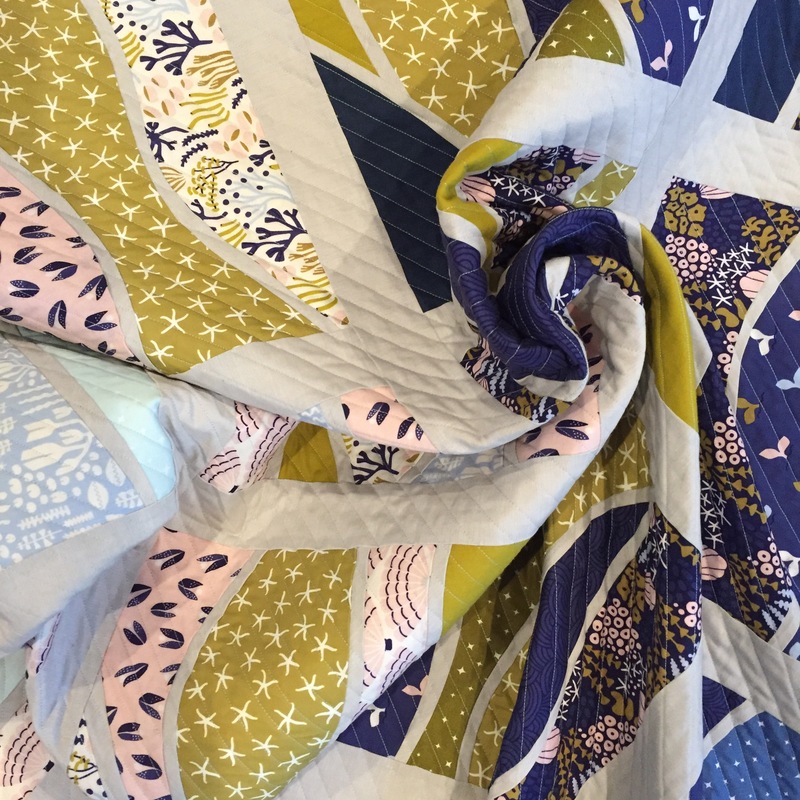 Enter my stash of Anna Maria Horner fabric, featuring big prints gorgeous enough for big squares. Combined with some easy free motion loops, it was a useful and satisfying project. On Saturday I taught a fun workshop with members of the Central Jersey MQG about creative walking foot quilting. They were a kind and talented bunch, and we had a great time. 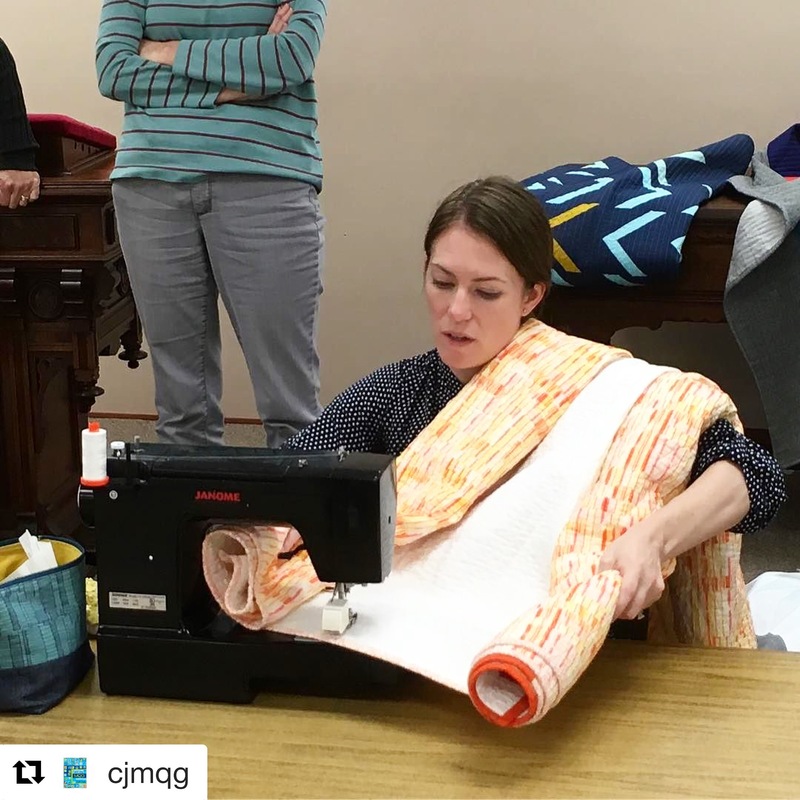 I did something that I’ve never done before in a class and pretended to sew while demonstrating how I wrestle a big quilt. I’ve done it at home so many times by myself that I felt a little silly doing it in front of people. But only a little! Sometimes you just have to do what you need to do to get the job done. And students told me that it was really helpful, so that’s the most important part. In addition to visiting CJMQG, I went to a show put on by the Warwick Valley Quilters Guild (Window no. 1 received an honorable mention! ), a lecture by Jacquie Gering at the Garden State Quilters Guild and my own guild’s monthly meeting, North Jersey MQG. That’s four guilds in seven days. At the NJMQG meeting I was the surprised and most honored recipient of a group quilt made to commemorate my term as president from 2013-2015. 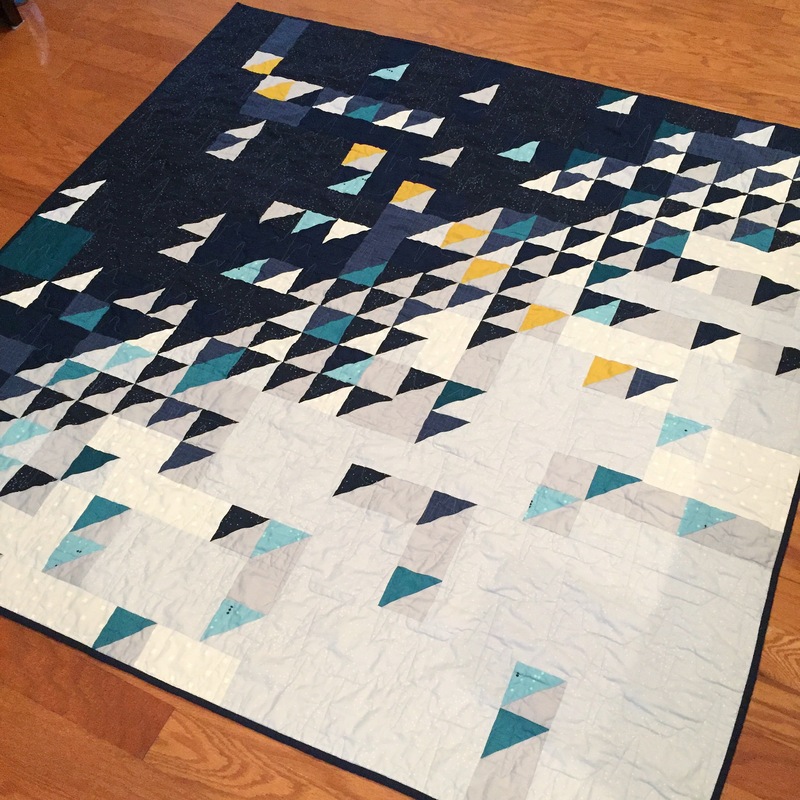 It is a gorgeous quilt made from some of my favorite colors and quilted with an EKG heartbeat motif. I am so grateful to everyone who contributed to the effort and signed a brick on the back. I will resurface again with the reveal of my market quilt and some more thoughts and projects in the weeks to come. Ha! I love your bandwidth observation. Yes, indeed. I also read that our brains run on glucose and we can run out of glucose. I’ve certainly felt that at times. It looks like an incredibly busy and awesome month. I wish you a bit of rest and some quilt dreams!